Janet had a suspected stroke fifteen years ago leaving her paralysed down the left side from the shoulder. Following this she had some physiotherapy and learned to walk hitching her hip with the aid of an extremely heavy calliper. Janet then experienced another episode two years ago, after which she was told she would never walk again or use the paralysed side’s arm. Vicky our Therapeutic Exercise Instructor started to work with Janet following a chance meeting at the supermarket, initially concentrating on her unaffected side and mobilising the paralysed side . The non affected hip had been replaced and had become so weak, she was finding it difficult to transfer and manage basic tasks. Her core stability and strength were extremely limited. She was also experiencing low mood and was reliant on her partner and carer to do all household tasks and self care. Gradually, her strength began to improve and she began to do tasks like putting washing in herself. We started to involve the paralysed side further working across the body’s sling systems to elicit activity. There were some inconsistencies in her ability and reactions so when we reached a point where she could control basic movement. Janet then had a physiotherapy assessment with Sarah. The combination of working with a Therapeutic Exercise Instructor and a Physiotherapist has been the best approach for Janet. The expertise in exercise therapy provided by Vicky and movement dysfunction from Sarah has given a targeted and functional approach to her rehabilitation. Sarah has also incorporated her wider knowledge of rehabilitation technology to support the rehabilitation programme. Sarah organised a smaller ankle foot orthosis to replace the calliper and suggested she could benefit from FES. 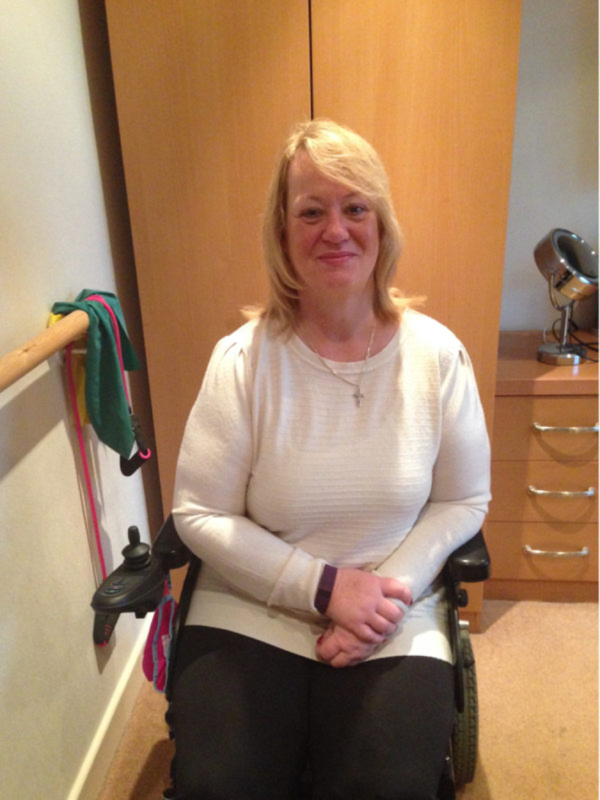 Janet began with basic stimulation of the quadriceps muscles and has been progressed to self supporting standing work. We have continued to work together and she is doing her own household tasks and can transfer easily. Janet is now standing with greater stability and is working towards walking movement. The multi-discipline approach together with Janet’s extremely hard work and commitment mean her outlook for the future improves all the time and we will continue to support her as long as she needs. Vicki is the sort of person that can motivate you even when you are down in the dumps and you can’t be bothered. She has given me faith in myself and a sense of hope that, if I work hard, I WILL walk again. I first met Vicki nearly 15 years ago when I had my first stroke. I attended classes at the local leisure centre for people with a disability and, over time, with NHS physiotherapy input, managed to learn to walk again. I had another episode over two years ago that took my left side away again and I was told I’d never walk again or be able to use my left arm.